Upload multiple files with model data in MVC is really very easy, when I started to test by uploading some files, I though it would be more complicated but it is really not. In my previous post ASP.Net MVC file upload, I promised to post soon about how to upload multiple files. When I was writing I thought why cannot add model data as well at the time of uploading the files. 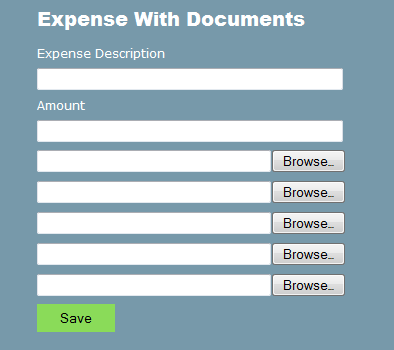 We will create a simple expense detail page with multiple files, I created a very simple just two value property, expense description and amount, which will be stored into database and as many files as we want supporting to this expense. We have not defined any property in our model to upload the file or list of files, we will discuss it why, once we will see our controller. In our post action we are not getting any file or list of files as a parameter. Yes, we don't need that, we can get a collection of files by using Request.Files as I am looping it and try to check the length of posted file if length is zero, try to check next control.